Steve Hill took his daughter Star to McGregor Lake, where she caught her first carp a 9lb Common. 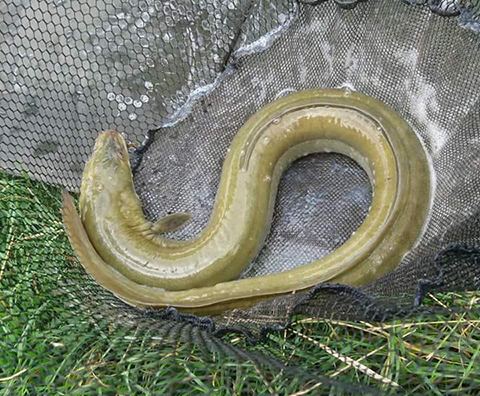 Steve also reported that he has caught several Eels from the lake, the largest just under 5lb. Once again the club is having to report that there have been several instances where rules have not been followed. The first involves discarded tackle, with one member reporting that several times at McGregor Lake he has picked up yards of line discarded in swims, unfortunately on one occassion a hook with a boilie left attached was discarded which was picked up by his dog, resulting it it swallowing the hook, this required a visit to the vets to have surgery for the hook to be removed. The club has also received yet another report of human waste being left in a swim om McGregor Lake, which had been covered up with some weed. This disgusting behaviour will not be tolerated and once again the club reminds everyone to read the rules and make sure that they have the necessary equipment with them. Any member found breaking the rules and leaving human waste on the fisheries will be banned for life.